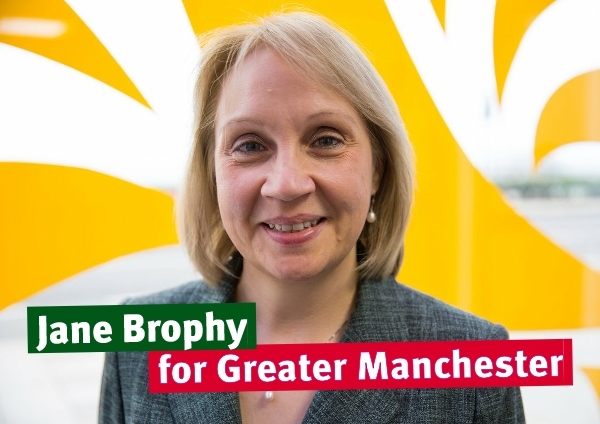 Jane Brophy, Liberal Democrat candidate for Mayor of Greater Manchester, is calling for the Greater Manchester Spacial Framework (GMSF) to be scrapped. The GMSF process will only go ahead if all ten councils in Greater Manchester and the newly elected mayor vote in favour of it. If any one of the eleven deciding vote against the plans, then it will fall – and the Liberal Democrat mayoral candidate is now pledging to do just that. Jane Brophy continued: “The Government and Greater Manchester Combined Authority should have worked together with local councils, local people and local communities to ensure no more houses were built on our greenbelt until all other options were exhausted. “There was no attempt to have any conversation with local people and their voices have been ignored. We now risk blindly destroying our green spaces and depriving our children of the areas to grow and play in. “Before we open up the greenbelt for development we must bring empty homes back into use, develop every old mill building, empty warehouse, factory, brownfield space and derelict piece of land that we can. “Only when all those options were exhausted should we have considered moving onto the greenbelt. But our voices have gone ignored for long enough and it’s now time to scrap this GMSF process. “There was no discussion about where was going to be developed, and clearly no intention to begin any discussion. “The GMSF has been top down, rather than from the bottom up. We need a plan that fully involves local people and their communities right from the start. “This should have been about responsibly building affordable homes in areas that are near public transport and existing links, and it should be for local people in each area to decide the future of their community, not for a secret group at Manchester Town Hall to present a completed plan. New figures show home ownership in our area is plummeting faster than anywhere else in the country. Plummeting home ownership across Greater Manchester and other major Northern cities shows housing is no longer just a London problem. English home ownership has fallen to levels last seen in 1986, with Greater Manchester experiencing double digit falls since their early 2000s peak, according to new Resolution Foundation analysis published today. John Leech, the former Manchester Lib Dem MP, said: “For years, housing, as with many other issues, has been completely fixated on the South. The analysis shows that having peaked at 71 per cent in 2003, the proportion of people owning their own home across England has fallen steadily over the last decade by seven per cent. The Foundation says that while much of the discussion around the struggle to buy a home has centred on London, Greater Manchester has actually recorded the sharpest fall in home ownership of any major city area in the last decade or so. Back in 2003, 72 per cent of households living in Greater Manchester were owners – slightly above the average across England as a whole. However, home ownership has since plummeted by 14 per cent – more than twice as fast as it has in England – so that by this year year just 58 per cent of households living in Manchester owned their own home. The Foundation notes that people living in Greater Manchester are no more likely to own a home than people living in Outer London, and that home ownership rates have fallen below all other big Northern city areas apart from Tyne & Wear. It says falling deposit affordability has played a major role in this trend. This fall in home ownership has corresponded with a near doubling in the proportion of private renters across England, up from 11 per cent in 2003 to 19 per cent in 2015. The proportion of households renting privately in Greater Manchester has more than trebled over that period – from 6 per cent to 20 per cent. The study also found that fewer than one in ten private renters did not expect to purchase a house because they liked it where they were, while just 1 per cent preferred the flexibility of renting to home ownership. Stephen Clarke, Policy Analyst at the Resolution Foundation, said: “The chances of owning a home have fallen fastest in Greater Manchester over the last decade.